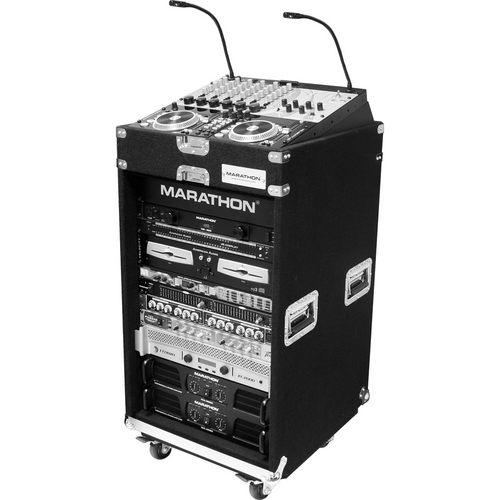 The Marathon MA-MC1016WE Economy Carpet Case (Black) is a durable carpet covered wood composite case with a 10-space precision steel rack rail slanted top and 16-space rack rail front to secure mixers, amps and electronics. The case has metal ball corners, 2 recessed latches in front and 1 on the back plus a removable lid. There is a lockable port on the front and back access doors. 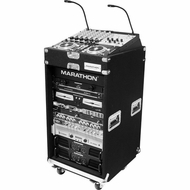 It is transported by recessed spring loaded chrome with rubber grip handles or a caster board with four 3.0" wheels; 2 with brakes.